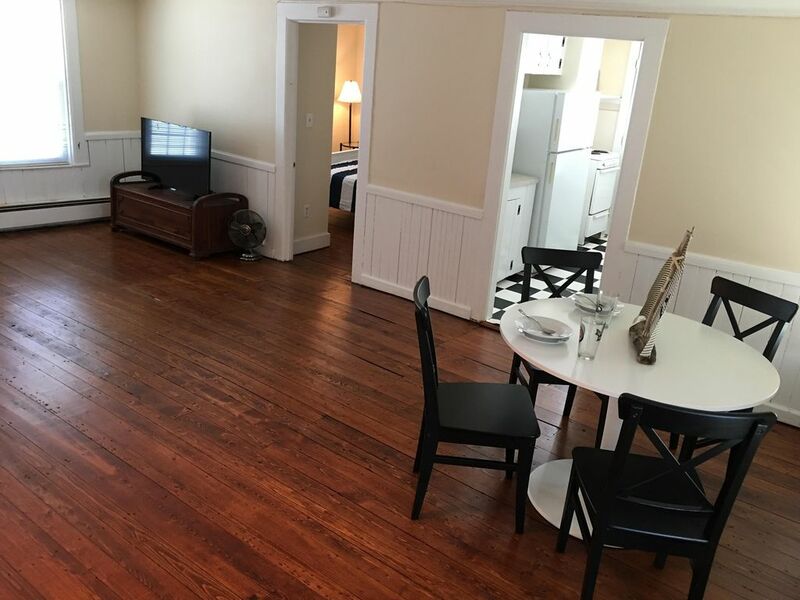 This one bedroom apartment in the heart of the Boro can accommodate up to four people. This is a gorgeous apartment with a private entrance from the outside of the historic Jonathon Waldron house. There is a queen size bed in the bedroom as well as a sleeper sofa in the living room. You will be just steps away from Dubois Beach which is the perfect daytime activity in the summer. There are great restaurants and shops nearby and you can walk to everything in the Boro! The property is also located less than 10 minutes away from the quaint town of Mystic, CT. In Mystic, you will find the Mystic Seaport, the Mystic Aquarium, a YMCA, and plenty of shops and restaurants. If you are feeling adventurous you can drive to golf courses which are 15 minutes away. Rhode Island beaches are just 15-20 minutes away (12 miles) and Foxwoods and Mohegan Sun are also approximately 15-20 minutes away. Property is well kept and place is easy to access. Perfect location for our family trip. Wonderful low key location, walking distance to beach and local shops. So fortunate to have found this spot in beautiful Stonington. Thank you to Alise for opening up her home to us. Kids had a great time. Thank you! We had an excellent stay, there was plenty of room for 2 adults, a toddler and a baby. And being with small kids, the short walk to restaurants and the little town beach was amazing. We took day trips to Mystic and had an overall fantastic time. Hope to book this again in the future! Perfect location with easy street parking and the ability to walk everywhere. It easily fit four adults for a weekend and we had a great time. the apt. was clean, functional, and very quiet.no parking problem; we just relaxed, enjoyed the great restaurants and did a lot of walking/reading.coming back to the noisy city was tough.